OWN A SLICE OF MELBOURNE HISTORY. The year is 1966. Decimal currency is introduced.. Harold Holt's in charge.. the Saints win the flag.. and a Melbourne icon is born. The Melway Street Directory is as much a part of this city as the MCG, the Yarra River, Flinders Street Station and W Class trams. 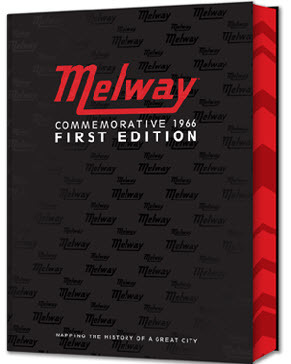 To celebrate, we've released a special Commemorative First Edition Melway. What did Melbourne look like in 1966? This sensational talking piece for any proud Melburnian's home is a collector's item, delivered in a beautiful display box. See the proposed site of the Melbourne Jetport, study the streetscape before freeways ringed the city, check out all the drive-in movie theatres, and discover how much has changed in your neighbourhood since 1966. This limited edition treasure is an excellent gift - a time capsule showing just how much Melbourne has changed in nearly half a century. Great for showing the kids what the area once looked like, and for learning about Melbourne's history in one of Victoria's most loved icons. View the original Key Map that accompanied the original 1966 street directory in small viewable images.